Though Tim Burton movies always look like Tim Burton movies, they’re always gorgeous in that special, vaguely dangerous Edward-Gorey-in-color-and-on-steroids way. (I’m sitting here at my desk facing a “Sweeney Todd” poster, with Johnny Depp staring right at me with his razor and his shock of white hair gleaming, and it’s pretty good inspiration for a deadline, I’ll tell you.) I’ve long thought “Alice in Wonderland” sounded like a perfect match for Burton, with all that menacing Victoriana, so am eagerly waiting the movie (in 3-D) in March. A new trailer’s out, and while I can’t embed it, here’s the link. Go ahead and watch; I’ll wait. 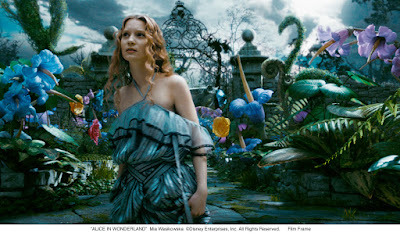 Very Burton, very strange (Alice in a strapless dress? Another new voice from Johnny Depp? ), very funny (The Red Queen — Helena Bonham Carter — and the pig), very potentially fabulous (love the shot of Alice shrinking into her gown). I’m off tomorrow, after a week spent watching holiday movies (five), reading Sir Arthur Conan Doyle (great stuff; how did I never read this before? ), and racing racing racing like the March Hare. Have a restful weekend, all.